In a photograph from the 1930s, two women with pin-curls have paused in the street. One is sporting a two-shelf book case. It is stacked with the slanting spines of books. The other has a volume in her gloved hands. Her head is bowed toward the open pages. "Critics are always remarking that we in this country lag far behind those of European countries when it comes to borrowing books from libraries. This enterprising girl at Rumsgate solves the problem by taking her books in a rack tied to her back round the streets and from door to door. And people can borrow them for a week at the price of twopence." Were walking libraries a thing? There is a rich history of people walking with books. And of book collections made for traveling. Performers Misha Myers and Deirdre Heddon have an ongoing art project exploring the junction of walking and books. It was inspired by historical stories. They write for the journal "Cultural Geographies." Poet John Keats walked to the Lake District in Scotland in 1818. He was carrying Dante's Divine Comedy and the works of John Milton. Conservationist John Muir took a thousand-mile walk. He carried "a copy of Robert Burns' poetry, Milton's Paradise Lost, William Wood's Botany. A small New Testament, a journal and a map." But Myers and Heddon also wanted to ask what books add to a journey and affect the experience of it. They also want to know how the landscape and moving through it affects the experience of reading. Carrying a full collection of books on a long trip would clearly have been tiring. But in 17th-century England, four individuals or families were lucky. 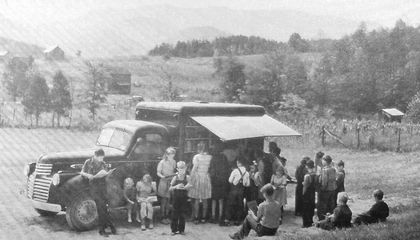 They had their own traveling library. All it needed were tiny books. There were about 50 gold-tooled, vellum-bound books. They were all bundled up into a larger wooden case. It was bound in brown leather to look like a book itself. These are held in the University of Leeds' special collections. This was a true traveling library. Four were made. "These traveling libraries were intended to be carried about by noblemen in their travels," writes David Kirby. He wrote for the Michigan Quarterly Review. Scholars aren't sure who made the four traveling libraries. But they suspect William Hakewill. He was a lawyer. He was also a bibliophile and legal historian. He lived from 1574 to 1655.
Who could afford such a custom-made treasure? Kings are one example. The traveling libraries were attractive. Napoleon Bonaparte was perhaps weary of lugging "several boxes holding about sixty volumes each" of his favorite books. He asked for his own traveling library. He got it from one M. Louis Barbier. He was in charge of the Louvre Library. That's according to an article published in the Sacramento Daily Union. It was published on June 8, 1885. Author Austin Kleon posted an excerpt from the paper. It was on his blog. It says that Napoleon asked that each tiny book in the library should "contain from five hundred to six hundred pages. And be bound in covers as flexible as possible and with spring backs." "There should be forty works on religion. Forty dramatic works, forty volumes of epic and sixty of other poetry. One hundred novels and sixty volumes of history. The remainder being historical memoirs of every period." What about the less well-heeled? A different kind of traveling library soon became available. Schools are still visited by traveling booksellers. They are now called book fairs or bookmobiles. These have their roots in traveling libraries from more than a century ago. These roving book collections first moved on horse-drawn carts and then automobiles. Rural areas especially relied on the visiting collections. Some communities still enjoy their own quirky versions today. But there is another potential walking library. A metaphor offered up by Kirby in the Michigan Quarterly Review. His essay was actually about the advent of electronic books. And what digital technology might mean for future readers. "An e-book reader that is reasonably priced and a pleasure to use will be the ultimate traveling library," he notes. He adds the warning that Kindles and Nooks likely won't mirror the future. That is any more than the Model T mirrored sleek, well-designed vehicles today. But in some ways, the e-book readers are like a library. Albeit a personal one. Users can even lend a book to a friend for a time with e-readers. What do you think is the best way to transport multiple books when you travel? Now that we have phones we read books on them. You can literally hold thousands of books in one hand that weighs not even 5 pounds! 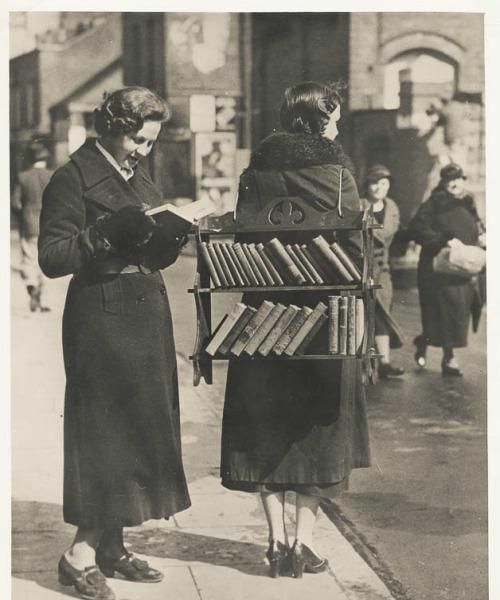 So that is the best way to transport books. I think you can put them in a backpack and then you can take many more books for your friends. The best option is too put them in a big bag and one that wont rip. in a box stacked on top of each other or in a bag but don't put to many in the bag because you wont want them to get messed up. The best way is to put them in big tubs and put them in your car and go to the place you are going to. I think the best way for me to transport multiple books is to transport them by vehicle because if you did it by foot then it would take a while because your arms would start to ache.